My grandma, my mom and I took the plane for Cairo together. We parted wih Mom at the airport: she was going to stay in Cairo with our cousin. 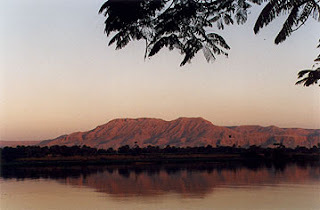 Mamie and I flew again to Luxor for the cruise on the Nile that my grandparents were offering me for my 18th birthday. I was besides myself with excitement as a very old dream of mine was coming true... Egypt! Amusingly, my visit of Egypt started with death, for it is to the west shore that we were bound on our first day. We were divided into three groups, each assigned an Egyptian guide. I was lucky to find myself in the group of Umeyma, from the School of Egyptology of Cairo, as informed a guide as there ever could be. The two other guides' names were Samer and Tamer, a source of glee for French-speakers as their names sounded respectively like "his mama" and "yo mama". 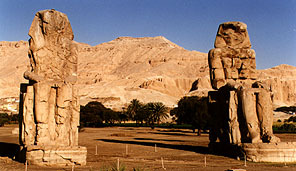 The Colossi of Memnon seem to guard the access to the necropolis. These two giant statues were originally the entrance colossi of the funerary temple of Amenophis III and Queen Ti, of which not a stone has survived. They were damaged (as were all Theban monuments) by an earthquake in 27 AD, and an enormous fissure opened in one of them. From then on, every day at sunrise, the statue emitted a moaning sound. Ancient Greek tourists assimilated it to Memnon, son of the Goddess Aurora (Dawn) killed in Troy, who would, every morning under Dawn's caress, answer his mother with a lament. Actually, the sound was due to vibrations that occurred on the surface of the statue when the temperature changed abruptly at sunrise. Later on Emperor Septimus Severus had the statues restored, and the fissure along with the moaning were stopped. As we continue towards the Valley of Kings, we pass by the Ramesseum, Ramses II's Temple of a Million Years, very badly preserved, as well as Ramses III's temple at Medinet Habou. 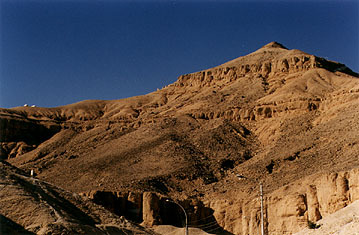 The Theban Necropolis is in an arid, unwelcoming stretch of land, all sun-bleached rocks and devoid of any living thing, even flies, except for some stray dogs who followed humans here. It was not this arid a few thousand years ago. All of Egypt was much greener, as the Nile valley was not as narrow as it is today. The Aswan dam is to be blamed for this; as I write it is still killing the country year by year, and the inhabitants are still as poor as they were fifty years ago. We didn't know whether to feel pity or annoyance as a trinket-waving crowd swarmed over us determined to sell us something. I chose to concentrate on the Egypt of the past. The Valley of Kings as well as the other tomb groups of the Necropolis date back from 1500 to 1080 BC: that is quite late in Egyptian history, a thousand years after the Pyramids were built. The burial policy had changed: in the hope of confusing tomb raiders, the heavy and conspicuous tomb forms were abandoned in favour of tombs hidden in the rock. Mortuary temples would be built in a public location, while the body and treasure would lie in a secret place. Unfortunately, it didn't have the planned effect. Very few tombs remained unfound and unviolated. Archaeologists are constantly finding new ones. You've most certainly heard of the most famous one, and you'll hear more when I reach that part of my tour. Notice the natural pyramid-shaped rock towering above our heads. The Egyptians never completely abandoned their ancestral customs: this rock means that the symbol of the pyramid was preserved even though the structure could no longer be built. None of the tombs in the Valley were completed, because work on them went on until the death of the Pharaoh. When the ruler passed away, the workers had 70 days to finish the frescoes and make the tomb as presentable as possible: it took that long for the mummification of the body that needed to be accomplished before the burial. Some tombs go so deep that they are not fully explored yet, which offers exciting prospects for the future. Be sure that a civilisation that endured for almost 4000 has not given up all its buried secrets yet. My first encounter with an Egyptian royal tomb was that of Ramses VI. I don't remember if I was originally underwhelmed at the idea of visiting tombs, but I do vividly remember that the moment I set foot in one, I didn't want to come out. The tomb slopes down, because the heavy granite sarcophagus had to be dragged down. The pharaoh usurped the tomb of his father Ramses V, and so the latter's reliefs are still visible under the present ones. I am completely fascinated by the narrative on the walls, so expressive I can intuit it. To my right is the Book of Doors, to my left the Book of Caves, two parts of the Book of the Dead that was the "user's manual" for the dead to find his way to heaven through the many obstacles of the underworld. Enemies are represented beheaded, and upside-down, symbolically signifying that they are in hell. A man-headed bird is constantly at the deceased's side: it is his ba, his soul. The image on the left is a recurring motif: the pharaoh with the head of a ram (therefore assimilated to an aspect of the Sun) traveling in the solar boat, a great snake lying on the roof above him. This can be confusing because elsewhere we see the traveller threatened by the monstrous hell-snake Apopis, who has three fire-spitting heads; but the snake on the solar boat is on the contrary a benevolent snake that protects the pharaoh. Obviously the Egyptians were capable of quite complex and even paradoxical associations of animals with concepts. Even the terrible crocodile, who was so dangerous, was worthy of respect and worshipped, as we will see in Kom Ombo. 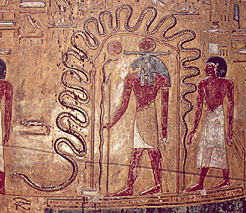 At one stage of his journey, the deceased must cross a desert and changes into a snake himself. He then confronts Apophis by reciting hymns which are written on the wall. The journey resumes then in the sun-boat, but this time a scarab is pulling it: it is Nun who symbolizes the beginning of life in the "Primordial Ocean". One of the final stage shows the traveller reciting 42 negations (I haven't killed, I haven't stolen...") before the Maât, Goddess of Truth, whose importance in Egypt was enormous. This tomb is heavily loaded with astronomical frescoes, such as Nut, the sky-Goddess, who stretches from wall to wall: her body is studded with stars, and the Sun is visible within and without it at different moments of its course. In the morning Nut gives birth to the sun-Kheperu, and in the evening she swallows the sun-Atum who will travel inside her during the night, to be born again. Let us get familiar at once with the three aspects of the Râ, the Sun, because they are all over Egypt. In the morning the Sun is Kheperu the Newborn, the beetle, the young Sun; at noon it is Amon the Hidden, the sun-disc, the Sun at the peak of its perfection and strength; in the evening it is Atum the Undifferentiated, the bent ram leaning on a stick, the old Sun. Sometimes the cycle of the Sun is represented by having Kheperu and Aton inside the disk of Amon. When Râ is associated with Horus as in the relief on the right, we get the God R?-Horakhty (at right), who symbolizes the protection of the two horizons East and West (Râ being the sun, East, and Horus the moon-God, West). The next tomb we visited was that of Ramses the First. He was the successor of Horemheb, himself the successor of Ay, successor of Tutankhamon, successor of Akhnaton, son of Tuthmosis III. Ramses the First was the father of Sethi the First, Ramses II's illustrious father. I am lining them up because this succession of names represents Egypt's greatest saga. This tomb has no decoration in the corridor. The builders probably didn't have time to complete it: Ramses I reigned only for 2 years. There are serdabs (niches) around the sarcophagus: these were meant for ushabtis, small humans figurines that would be the king's servants in the other world. Unlike other cultures of the time, the Egyptians did not kill a deceased man' wives and servants to bury them with him. We visited also the tomb of Ramses III, the last great Pharaoh of Egypt, after whom the decline of the land started and never stopped... Egypt would know richness during Roman times again, but the most important richness of its tradition and religion would be bastardized and gone forever. Umeyma now called a break for the group to sit in the shade, and Mamie asked me if I wanted to see the tomb of Tutankhamon. After the amazing sights that still filled my head, I wasn't very anxious to pay an extra ticket for a tiny and empty tomb (as I imagined it), but she insisted: "When we go to the Cairo Museum, you'll see all the Tutankhamon treasury. It will be more interesting if you first see the size of the room that contained it". So I went. The tomb is right next to that of Ramses VI which we visited first. I walked down a flight of stairs and reached a first tiny room where an Egyptian guide lead me into the next room, and I got the shock of my life at the sight that awaited me. This picture taken from a book is not very good, though. The tomb was actually much darker, with the frescoes visible but discreet, while the sarcophagus, which still contains the mummy, shone out of the gloom. I had a mesmerizing, surreal time as the guide explained, in a low, gentle, appropriate voice, the story of the discovery of this tomb, while I couldn't take my eyes off the sarcophagus with its young king still inside, the only undisturbed Pharaoh... 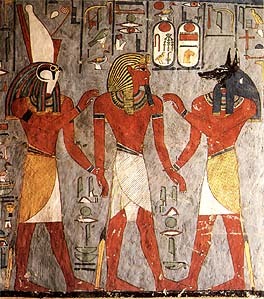 The baboons on the wall open the doors of the Beyond; the pharaoh followed by his ka, his spirit, greets Osiris. I actually didn't hear a single word of the guide's story, but the sound of his voice provided the perfect background for my contemplation. I flashed him a grateful smile and blessed him in Arabic before reluctantly returned to the surface. The story of the finding of the cave was later told to us in details by Umeyma. I won't repeat it in full because it's extremely famous and I'm talking too much already. I'd just like to mention that when the ecstatic crew listed the objects that were found in this tomb, the most moving object of them all was a small garland of flowers, probably a farewell gift from the king's young wife Ankhesenamen: these poor dried-up flowers still kept a hint of their original color, after 32 centuries. Not only is Tutankhamon's the only mummy I know of who wasn't removed from its tomb (it's so delicate it can't be moved), but the young king has become the most famous of all of Egypt's pharaohs. For a people that believed that true death only came when one was forgotten, that's quite a compensation for spending millenia in oblivion. 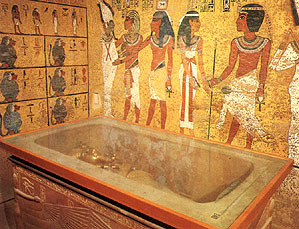 Indeed, Tutankhamon was an insignificant king who had to buried in what was a room meant for another use. Nobody had ever searched for his tomb because, along with Akhnaton and Hatshepsut, he wasn't mentioned in the royal lists of the Egyptian historian Manetho. 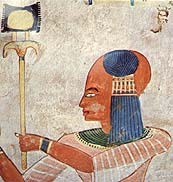 Akhnaton's crime was the "heresy" of imposing a monotheist religion on Egypt (the clergy of Amon did not appreciate his displacement by Aton, which meant that their power would decrease); Hatshepsut's was to have crowned herself king (instead of queen) and so prevented her nephew from ascending the throne. Tutankhamon's was not a crime: he was just so utterly meaningless that nobody remembered him. His kinness to Akhnaton (one theory makes him his brother, but nobody really knows) may have disgraced him as well, though he immediately went back to the cult of Amon when he became king at 9. He died at 18 or 19, most likely assassinated by general Horemheb who was crowned shortly after (the back of his head bears the trace of a heavy blow). We climbed the bus again to move on to the Valley of Queens. The first tomb we visited however belonged to a young prince. He died so young that he was still represented, on the frescoes, with the main attribute of childhood: the "lock of childhood". The two other attributes are nudeness, and a finger in the mouth. Amen-Khopshef, the son of Ramses III who owned this tomb, was still considered a child when he died, and this is why he lies in the Valley of Queens: he is buried by his mother's tomb. That's not the most touching part of it. We have seen that the funerary frescoes depict the occupant on the tomb greeting the Gods on his way to the other world. 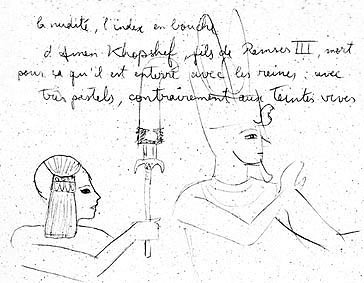 What we see here is Amen-Khopshef following his father who walks ahead of him to clear the way and intercede to Osiris on his son's behalf. There is also a mummified foetus in a corner, probably a stillborn brother of the young prince. The colours here are strikingly pastel compared to the vivid hues of the kings' tombs. Speaking of children, I'd like to clarify something about the 52 "sons" of Ramses II who are buried together in the Valley of Kings. These "royal sons" were actually the children of noblemen trusted by the Pharaoh, and he took them in to raise them as princes in order to ensure that he would have many able candidates to the succession. In a culture where for a husband to call his wife "sister" is the standard mark of love and respect, words designating family bonds should no be taken too literally. The tomb of Nefertari, which also requires an extra ticket, is a moving testimony of Ramses II's love for his first wife. It has been pillaged and the mummy had been reduced to pitiful remains, but its mere size and structure and the richness of the frescoes say enough. This was certainly the biggest and most beautiful tomb of the entire Valley of Queens. 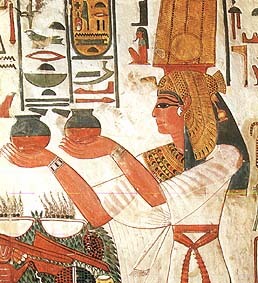 I am very moved by the representations of Nefertari making herself up and presenting offerings. Look at the delicacy of the fresco that uses transparency effects on her dress!